Jonah, the man who prayed in the fish’s belly, brings to view another remarkable instance of these Old Testament worthies who were given to prayer. This man Jonah, a prophet of the Lord, was a fugitive from God and from the place of duty. He had been sent on a mission of, warning to wicked Nineveh, and had been commanded to cry out against them, “for their wickedness is come up before me,” said God. But Jonah, through fear or otherwise, declined to obey God, and took passage on a ship for Tarshish, fleeing from God. He seems to have overlooked the plain fact that the same God who had sent him on that alarming mission had His eye upon him as he hid himself on board that vessel. A storm arose as the vessel was on its way to Tarshish, and it was decided to throw Jonah overboard in order to appease God and to avert the destruction of the boat and of all on board. But God was there as He had been with Jonah from the beginning. He had prepared a great fish to swallow Jonah, in order to arrest him, to defeat him in his flight from the post of duty, and to save Jonah that he might help to carry out the purposes of God. It was Jonah who was in the fish’s belly, in that great strait, and passing through a strange experience, who called upon God, who heard him and caused the fish to vomit him out on dry land. What possible force could rescue him from this fearful place? He seemed hopelessly lost, in “the belly of hell,” as good as dead and damned. But he prays—what else can he do? And this is just what he had been accustomed to do when in trouble before. Prayer was the mighty force which brought Jonah from “the belly of hell.” Prayer, mighty prayer, has secured the end. Prayer brought God to the rescue of unfaithful Jonah, despite his sin of fleeing from duty, and God could not deny his prayer. Nothing is too hard for prayer because nothing is too hard for God. That answered prayer of Jonah in the fish’s belly in its mighty results became an Old Testament type of the miraculous power displayed in the resurrection of Jesus Christ from the dead. Our Lord puts His seal of truth upon the fact of Jonah’s prayer and resurrection. Nothing can be simpler than these cases of God’s mighty deliverance. Nothing is plainer than that prayer has to do with God directly and simply. Nothing is clearer than that prayer has its only worth and significance in the great fact that God hears and answers prayer. This the Old Testament saints strongly believed. It is the one fact that stands out continuously and prominently in their lives. They were essentially men of prayer. How greatly we need a school to teach the art of praying! This simplest of all arts and mightiest of all forces is ever in danger of being forgotten or depraved. The further we get away from our mother’s knees, the further do we get away from the true art of praying. All our after-schooling and our after-teachers unteach us the lessons of prayer. Men prayed well in Old Testament times because they were simple men and lived in simple times. They were childlike, lived in childlike times and had childlike faith. When God smote the child born of Bathsheba, because David had by his grievous sins given occasion of the enemies of God to blaspheme, it is no surprise that we find him engaged in a week’s prayer, asking God for the life of the child. The habit of his life asserted itself in this great emergency in his home, and we find him fasting and praying for the child to recover. The fact that God denied his request does not at all affect the question of David’s habit of praying. Even though he did not receive what he asked for, his faith in God was not in the least affected. The fact is that while God did not give him the life of that baby boy, He afterward gave him another son, even Solomon. So that possibly the latter son was a far great blessing to him than would have been the child for whom he prayed. In close connection with this season of prayer, we must not overlook David’s penitential praying when Nathan, by command of God, uncovered David’s two great sins of adultery and murder. At once David acknowledged his wickedness, saying unto Nathan, “I have sinned.” And as showing his deep grief over his sin, his heart-broken spirit, and his genuine repentance, it is only necessary to read Psalm 51 where confession of sin, deep humiliation and prayer are the chief ingredients of the Psalm. David knew where to find a sin-pardoning God, and was received back again and had the joys of salvation restored to him by earnest, sincere, penitential praying. Thus are all sinners brought into the divine favor, thus do they find pardon, and thus do they find a new heart. The entire Book of Psalms brings prayer to the front, and prayer fairly bristles before our eyes as we read this devotional book of the Scriptures. Nor must even Solomon be overlooked in the famous catalogue of men who prayed in Old Testament times. Whatever their faults, they did not forget the God who hears prayer nor did they cease to seek the God of prayer. While this wise man in his later life departed from God, and his sun set under a cloud, we find him praying at the commencement of his reign. Solomon went to Gibeon to offer sacrifice, which always meant that prayer went in close companionship with sacrifice, and while there, the Lord appeared to Solomon in a vision by night, saying unto him, “Ask what I shall give thee.” The sequel shows the material out of which Solomon’s character was formed. What was his request? “O Lord my God, thou hast made thy servant king instead of my father; and I am but a little child; I know not how to go out or to come in. “And thy servant is in the midst of thy people which thou hast chosen, a great people, that cannot be numbered nor counted for multitude. “And the speech pleased the Lord, that Solomon had asked this thing. “Behold I have done according to thy word; Lo, I have given thee a wise and understanding heart; so that there was none like thee before thee, neither after thee shall any arise like unto thee. What praying was this! What self-deprecation and simplicity! “I am but a little child.” How he specified the one thing needful! And see how much more he received than that for which he asked! Take the remarkable prayer at the dedication of the temple. Possibly this is the longest recorded prayer in God’s Word. How comprehensive, pointed, intensive, it is! Solomon could not afford to lay the foundations of God’s house in anything else but in prayer. And God heard this prayer as he heard him before, “And when Solomon had made an end of his praying, the fire came down from heaven, and the glory of the Lord filled the house,” thus God attested the acceptance of this house of worship and of Solomon, the praying king. 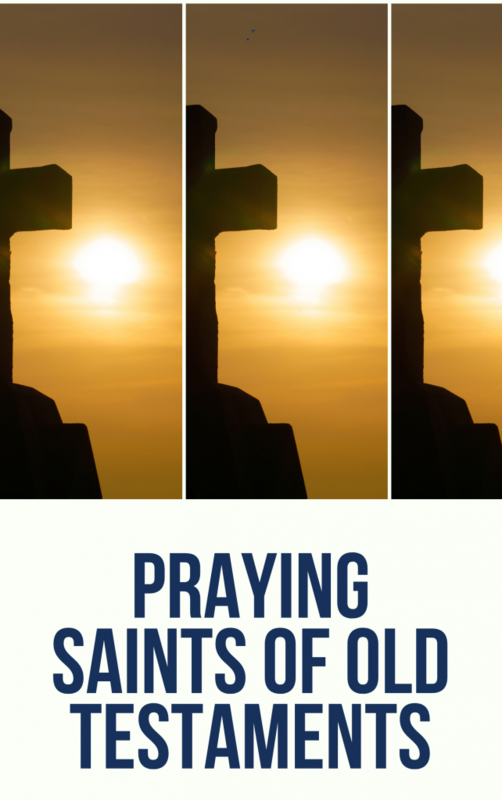 The list of these Old Testament saints given to prayer grows as we proceed, and is too long to notice at length all of them. But the name of Isaiah, the great evangelical prophet, and that of Jeremiah, the weeping prophet, must not be left out of the account. Still others might be mentioned. These are sufficient, and with their names we may close the list. Let careful readers of the Old Scriptures keep the prayer question in mind, and they will see how great a place prayer occupied in the minds and lives of the men of those early days.